Controversial merger plans have been described as 'bold and imaginative'. New legislation which will create single police and fire services for Scotland has been unveiled. The Scottish Government says bringing together existing regional forces will save around £1.7bn over 15 years. All crew will be transferred to the new Police Service of Scotland and Scottish Fire and Rescue Service, under new plans. The Police and Fire (Reform) Scotland Bill will also establish local senior officers in each council area, give parliament formal opportunities to scrutinise services and create a new Scottish Police Authority (SPA) and fire board to hold chief officers to account. Justice Secretary Kenny MacAskill said: "The reasons for reform are clear. We need to make a virtue of necessity. "Make no mistake, this is the only way to make sure that we don't lose the major improvements made to police and fire and rescue services in recent years. "We have devised the strongest possible plans for the future of police and fire services in Scotland which reduce duplication, not the quality of vital services, and deliver estimated efficiency savings of £1.7bn over 15 years." The new single force would mean a stronger connection between communities and their local services with designated local senior officers and a statutory duty to provide "proper local provision", Mr MacAskill said. He added: "Our services will be independent, with no operational control from ministers but subject to parliamentary scrutiny. And our new services will be nothing without the skills and talents of the workforce. Staff will transfer to the new services on the same terms and conditions." Chief superintendent David O'Connor, president of the Association of Scottish Police Superintendents (ASPS), called for an early appointment of the chief constable designate, and that the headquarters should be Tulliallan Castle in Fife, the home of the Scottish Police College. Mr O'Connor added: "I do not underestimate the scale of the challenge but a pragmatic and incremental approach which focuses upon maintaining service delivery to the current high levels together with improving public and staff confidence throughout must be at the centre of all that we seek to achieve and the public demands." 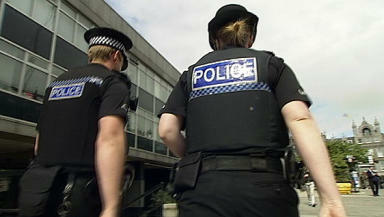 The new police force could be running by April 2013 at the earliest, the government said. Plans for a consultation on the mergers were announced in September last year. Professor John McNeill, Police Complaints Commissioner for Scotland, branded the proposals "bold and imaginative" and said they were a "once-in-a-generation opportunity". He said: "The overall direction of police reform is the right one. I welcome the expansion of the existing PCCS to include the powers to undertake investigations as directed by the Crown and where there is a public interest. "Giving the Police Investigations and Review Commissioner the power to investigate the most serious complaints represents an important step forward in how we hold the police to account in this country. It makes a significant contribution towards increasing public confidence in the police in Scotland. "A single police force in Scotland makes it essential that there is an independent body holding them to account."